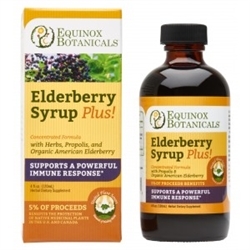 Borrowing from an old Appalachian recipe, this syrup combines elder flower, yarrow, lemon balm, peppermint, slippery elm, and propolis with North American elderberry juice concentrate to create a syrup that is both nutritious and delicious. Includes vitamins, minerals and a class of polyphenols known as anthocyanins, an anti-oxidant pigment found in the blue-black berry. Ingredients: Proprietary Blend Ingredients*: American Elder (Sambucus nigra canadensis) berry and flower, Slippery Elm (Ulmus fulva) bark, Yarrow (Achillea millefolium) flower, Lemon Balm (Melissa officinalis) leaf, Propolis (Apis mellifera) resin, Peppermint (Mentha piperata) leaf. Other Ingredients: USP Grade Glycerine, Organic Tart Cherry Concentrate, Purified Spring Water, Honey, Brandy. *All herbs are either organically grown or ethically wildharvested.